Spring is in the air! April is an important month with students studying for annual assessments, including AzMERIT, ACT, AP tests, etc. We are all focused on student academic achievement with staff teaching bell-to-bell every day. We offer additional tutoring on every campus to support our students during this busy time of year. Make sure your students are getting plenty of rest and that they are keeping up on their studying so that they can do well on these important exams. Construction is coming along nicely on the newest addition to our TUHSD family as West Point High School is set to open for freshmen and sophomores for the 2019–2020 school year. The school has already had two very successful and well-attended parent nights. With that, we have a lot to share with regards to student successes this month. We’d like to congratulate Jonathan Pham from Westview High School. The ceramic work he created, Navajo Horse Hair Pottery with feathers, was selected for inclusion in this year's annual National K–12 Ceramic Exhibition in Minneapolis, MN. Jonathan’s horsehair pottery was selected from over 1,100 pieces from high schools all over the United States for the national show. This is truly an amazing honor for Jonathan and our district. Students at Copper Canyon High School were treated to a surprise visit by country music superstar, Garth Brooks, and Arizona Cardinals star, Larry Fitzgerald. The students were super excited to see Garth Brooks and Larry Fitzgerald in person as they heard both of them talk about their struggles and how they took adversity and disappointment and made the most of the opportunities given them. The powerful messages resonated with all of the students. It was a great event for Copper Canyon High School. We are happy to announce that 151 new Career and Technical Education (CTE) student seats from the Tolleson Union High School District have been allocated for the 2019–2020 Central Programs at West-MEC. This is outstanding and a great opportunity for our CTE students who continue to shine. Speaking of CTE, four of our automotive students recently competed in the Region Five SkillsUSA competition at Glendale Community College. Ricardo Carranza placed third in the competition qualifying for our SkillsUSA State Competition. Congratulations to these young men for representing Tolleson so well. In April our students will get a four-day weekend, with Cesar Chavez Holiday falling on Friday, April 19 and spring recess on Monday, April 22. Please mark your calendars accordingly. Classes will resume on Tuesday, April 23. Graduation will be on Tuesday, May 21. Last day of classes for the 2018–2019 school year is Friday, May 24. 2019–2020 first day of school for freshmen only is Wednesday, July 31. 2019–2010 first day of school for all students is Thursday, August 1. Want to keep up with the latest news on our district? The best way to do that is to check our website for important information. To learn more about our district, follow us on Facebook or on Twitter. The Tolleson Union High School District's newest high school will be at Avondale Blvd. and Encanto Blvd. in the City of Avondale. We expect the new school to open for the 2019–2020 school year. TUHSD is proud to feature guest author messages. Teacher - Sierra Linda High School English teacher Karen Baltajian offers her thoughts on curiosity. Student - University High School senior Irene Franco Rubio shares her thoughts on her high school career. Please visit our Featured Author Archives to view past guest author messages. 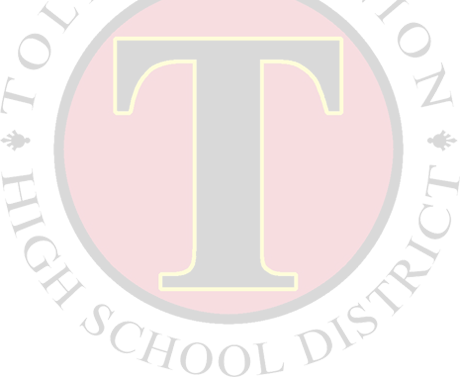 TUHSD - Do It With Pride! Looking for a fun job over the summer? 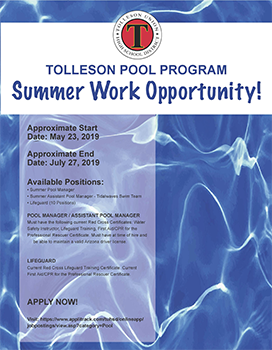 The Tolleson pool program has a summer work opportunity for you! It's not too early to start thinking about graduation! The AzMERIT tests will take place on Monday, April 8, 9, and 10, with makeups sessions occurring through Friday, April 26. Summer school will take place at Westview High School from May 28 through June 28.